Flat roofs collect an abundance of debris that can’t be removed daily. During rainstorms, this debris gets washed into the gutter trough and clogs it, preventing proper drainage. Over time debris accumulates in the trough, causing it to overflow, which compromises the exterior walls and the foundation with water infiltration. It is essential to keep the roof free of debris at all times. Doing so, will allow water to flow freely to the tough, through the downspouts and leader pipes, and away from the building for proper drainage. If there are branches that hang over your flat roof, we recommend that you remove the debris from the roof and the gutters as often as you rake leaves or mow your lawns or yards. The easiest way to remove debris from flat roofs and gutters is to use a handheld leaf blower. Flat roofs should be pitched or sloped towards gutters for positive water flow. Even when they are, we often see that the edge of the roof is slightly higher due to a tar build-up, from repeated repairs, preventing water from flowing into the gutter. 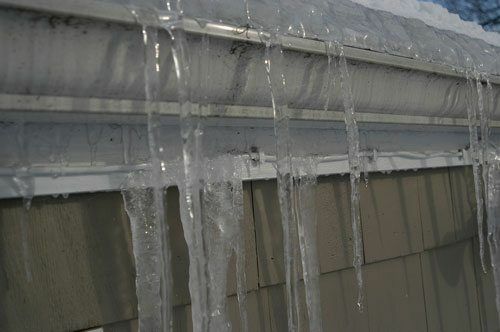 This can cause ponding on the roof, which can lead to leaks. Gutters should also be flush with fascia board to prevent water from flowing behind gutter troughs, if not, water will damage the walls or paint. Follow these preventive flat roof and gutter inspection and maintenance procedures for a well-maintained drainage system. Inspect the entire gutter system; the quality of all seams, joints, and downspouts. Check that gutter brackets and hangers are properly secured. Make sure the gutter is properly angled to create positive water flow. Keep tree branches trimmed away from flat roofs and gutters to prevent damage from high winds. After severe storms, inspect both the roof and gutters to remove debris. Ensure that leader pipes are well positioned to funnel water away from the foundation.